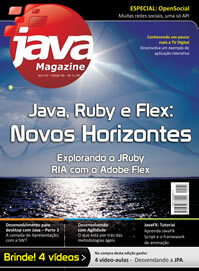 Já está nas bancas meu artigo sobre Java e Flex na revista Java Magazine! O nome do artigo é Interfaces de qualidade com Adobe Flex. Ele é voltado para quem não conhece nada, ou está começando à aprender Flex e conhece um pouco de Java. No artigo Faço uma analogia entre a Linguagem ActionScript 3.0 e Java 5, apresento algumas formas de consumir dados e também como fazer que um código feito para executar na Web com o Flash Player, possa ser executado no Desktop sem alterar uma linha de código funcional. Estou por finalizar um próximo artigo, nesse o foco está em apresentar como utilizar o Flex em aplicações corporativas, integrando com SpringFramework e EJBs utilizando o JBoss. Sem mais, por favor deixe o seu feedback! This entry was posted in Adobe Flex, Java, Vários and tagged Adobe Flex, Artigo, Java, Java Magazine on May 29, 2009 by Rodrigo Pereira Fraga. Hi! I know this is kind of off topic but I was wondering which blog platform are you using for this site? I’m getting tired of WordPress because I’ve had issues with hackers and I’m looking at options for another platform. I would be great if you could point me in the direction of a good platform. My programmer is trying to persuade me to move to .net from PHP. I have always disliked the idea because of the expenses. But he’s tryiong none the less. I’ve been using Movable-type on several websites for about a year and am worried about switching to another platform. I have heard good things about blogengine.net. Is there a way I can transfer all my wordpress posts into it? Any help would be really appreciated! Excellent post however I was wanting to know if you could write a litte more on this subject? I’d be very grateful if you could elaborate a little bit more. Bless you! He that evill does, never good weins. While I genuinely like this publish, I believe there was an punctuational error close to the finish of your third paragraph. Fantastic article! How long have you been operating your website? Hi there I am so grateful I found your site, I really found you by error, while I was researching on Digg for something else, Anyhow I am here now and would just like to say thank you for a incredible post and a all round thrilling blog (I also love the theme/design), I don’t have time to read through it all at the minute but I have book-marked it and also added your RSS feeds, so when I have time I will be back to read a lot more, Please do keep up the great work.